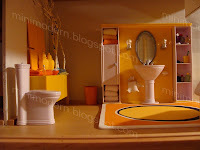 These bathroom pieces are from the discontinued Mini World sets distributed by Theo Klein. The tub, vanity sink and toilet are Villeroy & Boch designs that feature lights that work on the vanity, running water sounds for the sink and a flushing sound for the toilet. 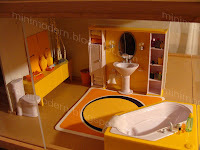 None of these sounds are necessary, but they produce a good laugh for visitors who tinker around with the miniature furnishings. I would have preferred a double vanity, but...shrug.